BBG is pleased to announce that respected industry-veteran Evans Howell, MS, REPA, has joined the team as Executive Managing Director. 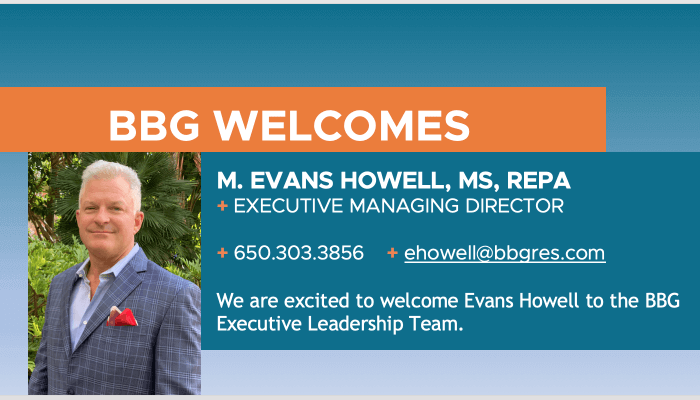 As part of his new role and responsibilities, Mr. Howell will oversee the ongoing strategic growth of BBG’s multiple business lines and ensure continued high-quality and consistent delivery of bundled services to clients, with a focus on portfolio-related processes and systems. Bringing a wealth of experience in the real estate due diligence field, Mr. Howell has managed numerous due diligence projects and portfolios for clients including investors, equity funds, insurers, commercial mortgage-backed securities, HUD, FHA, and Fannie Mae and Freddie Mac lenders. Before joining BBG, Mr. Howell served as an Executive Vice President at AEI Consultants, a commercial real estate assessment and consulting firm, where he was responsible for managing the firm’s due diligence and engineering services. Earlier in his career, Mr. Howell held senior-level positions at various companies including Land America Financial Group, Partner Engineering and Science, Inc., and National Assessment Corp. His technical background also includes work as an environmental scientist and hydrogeologist.